The eurosceptic party was set up three months ago due to fears over Brexit delays. Last week alone it received “hundreds of thousands of pounds” in donations as it gears up for May’s European elections. The party is set to field 70 candidates across the country. Over the weekend, Mr Farage revealed the party was selecting representatives from “all walks of life”. Speaking to The Telegraph, he said: “We will have a full slate of candidates featuring people from all walks of life, including business and academia, and all areas of the country. “Many have never been party political before and some of them will have instant name recognition." Mr Farage led his former Ukip party to victory in the last EU elections in 2014, winning 24 MEPs. 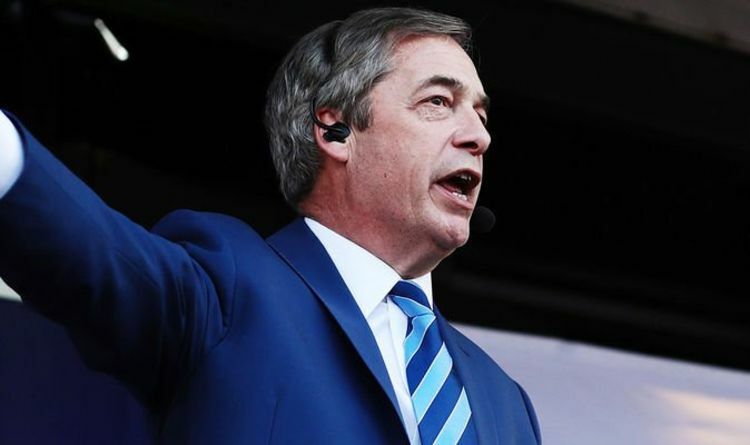 Seven have followed Mr Farage and switched to the newly-formed Brexit Party after Ukip lurched to the far-right. In a Twitter post yesterday, the leading Brexiteer warned the Tories are “in for a big shock” in the elections. It comes after Prime Minister Theresa May asked Labour leader Jeremy Corbyn for Brexit talks last week in a bid to reach a compromise on her divorce deal. The move sparked a furious reaction from Tories including former foreign secretary Boris Johnson and prominent backbencher Jacob Rees-Mogg. However the discussions appear to have stalled with no face-to-face talks currently scheduled. The UK is currently due to leave the bloc on Friday but Mrs May is meeting EU leaders at a summit on Wednesday to request a further extension.